While having only 2 of his 24 RAM slots full, we can make do with this – besides, filling it up to 1.5TB of RAM will cost $14,400 – ouch! Specifically, I think we can make this into a nice host of lots and lots of virtual machines (VMs) via a modern day hypervisor. Looking about at what might be a good solution for this, I cast my eyes upon LXD. 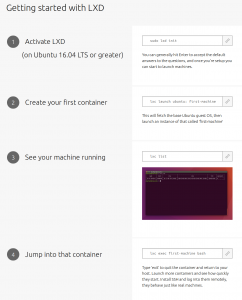 I’m already a huge fan of Ubuntu, the OS LXD works best with. As well, with 2.0, Canonical is really pumping up LXD as a viable, production worthy solution for a running your own cloud compute. Given that 2.0 now ships with Ubuntu 16.04, I figured I’d give it for a spin. I’m guessing a techie at Canonical got a hold of a marketing person at Canonical; they realized that with LXD baked into Ubuntu, anyone comfy on the command could line run 4 steps to get an instant container. This meant that while there’s a lot more complexities to getting a LXD running in a production environment (LAN bridge, ZFS Pools, ZFS Caches, JBOD on your RAID card, static IPs dynamically assigned, all covered below), it was indeed intensely satisfying to have these 4 steps work exactly as advertised. Sign me up! But what about the other options? Did I look at more holistic approaches like OpenStack? Or even the old, free as in beer vSphere? What about the up and coming SmartOS (not to be confused with the unrelated TrueOS or PureOS)? Given the timing of the demise of SmartOS’s roots in Solaris, maybe it’s time to pay my respects? Finally, there is of course KVM. While I will still will take up my friend’s offer to run through an OpenStack install at a later date, I think I’m good for now. This write up covers my learning how to provision my particular bare metal, discovering the nuances of ZFS and finally deploying VMs inside LXD. Be sure to see my conclusion for next steps after getting LXD set up. ZFS – the file system that allows for snapshots, disk limits, self healing arrays, speed and more. JBOD/RAID – Two different disk configurations we’ll be using. 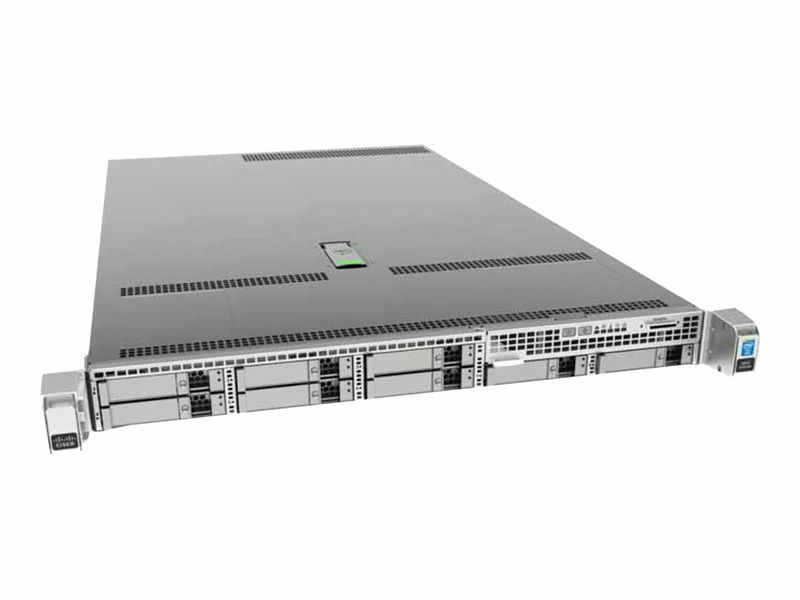 CIMC – Cisco Integrated Management Interface which is a out of band management that runs on Cisco server hardware. Allows remote console over SSL/HTML. Stéphane Graber – Project leader of LXC, LXD and LXCFS at Canonical as well as an Ubuntu core developer and technical board member. I call him out because he’s prolific in his documentation and you should note if you’re reading his work or someone else’s. KVM – “Keyboard/Video/Mouse” – The remote console you can access via the CIMC via a browser. Great for doing whole OS installs or for when you bungle your network config and can no longer SSH in. KVM – The other KVM ;) This is the Kernel Virtual Machine hypervisor, a peer of LXC. I only mention it here for clarification. Hence forth I’ll always be referencing the Keyboard/Video/Mouse KVM, not the hypervisor. Aaron Toponce’s ZFS on Debian GNU/Linux – while originally authored back on 2012, this series of posts on ZFS is canon and totally stands the test of time. Every other blog post or write up I found on ZFS that was worth it’s salt, referenced Aaron’s posts as evidence that they knew they were right. Be right too, read his stuff. Before starting out with this project, I’d heard a lot of bad things about getting Cisco hardware up and running. While there may indeed be hard-to-use proprietary jank in there somewhere, I actually found the C220M4 quite easy to use. The worst part was finding the BIOS and CIMC updates, as you need a Cisco account to download them. Fortunately I know people who have accounts. After you download the .iso, scrounge up a CD-R drive, some blank media and burn the .iso. Then, plug in a keyboard, mouse and CD drive to your server, boot from it with the freshly burned disk, and upgrade your C220. Reboot. Then you should plug the first NIC into a LAN that your workstation is on that has DHCP. What will happen is that the CIMC will grab an address and show it to you on the very first boot screen. You see that 10.0.40.51 IP address in there (click for large image)? 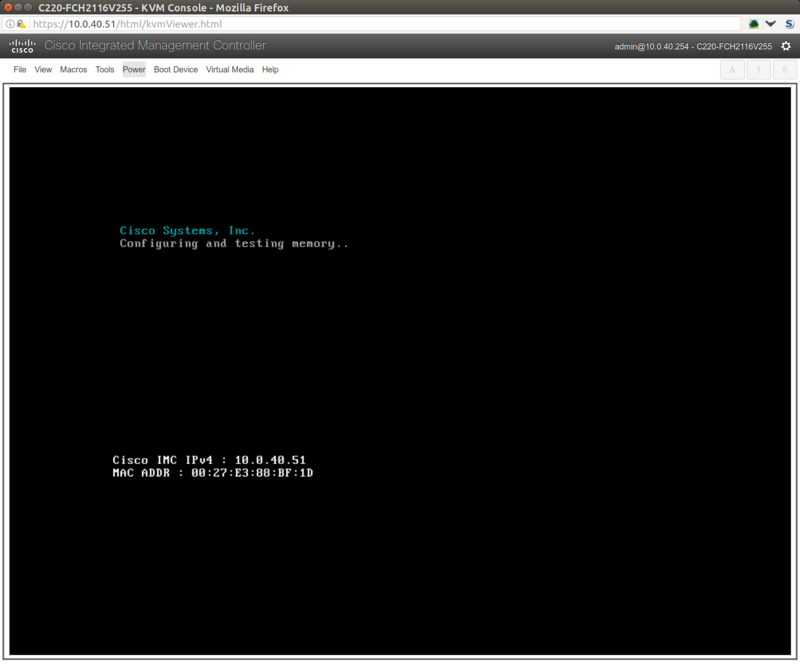 That means you can now control the BIOS via a KVM over the network. This is super handy. Once you know this IP, you can point your browser to the c220 and never have to use a monitor, keyboard or mouse directly connected to it. Handy times! To log into the CIMC the first time, default password is admin/password (of course ;). I’ve highlighted two items in red: the first, in the upper left, is the secret, harder-to-find-than-it-should-be menu of all the items in the CIMC. The second, is how to to get to the KVM. For now, I keep the Ubuntu 16.04 install USB drive plugged into the C220. Coupled with the remote access to the CIMC and KVM, this allows to me to easily re-install on the bare metal, should anything go really bad. So handy! 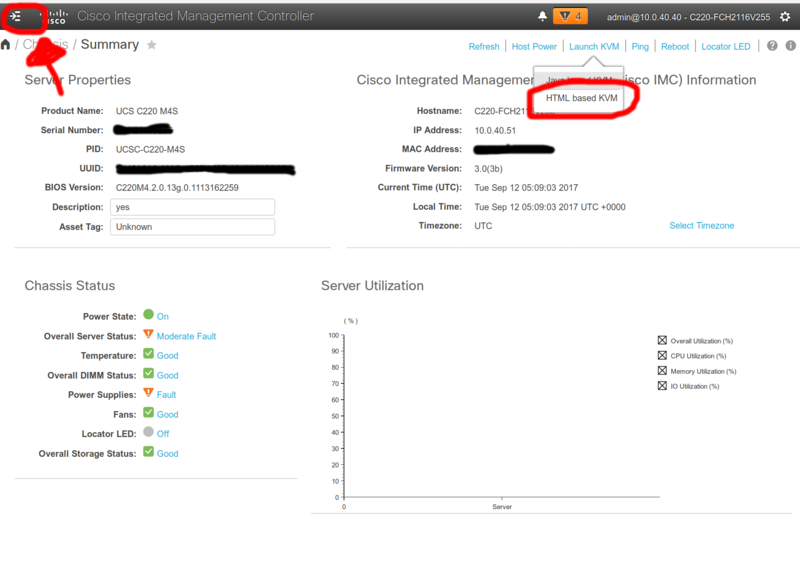 While you’re in here, you should change the password and set the CIMC IP to be static so it doesn’t change under DHCP. Really, this is too bad that this server has a RAID card. ZFS really wants to talk to the devices directly and manage them as closely as possible. Having the RAID card expose them as JBOD isn’t ideal. The ideal set up would be to have a host bus adapter (HBA) instead of the raid adapter. That’d be a Cisco 9300-8i 12G SAS HBA for my particular hardware. So, while I can get it to work OK, and you often see folks set up their RAID cards as JBOD just like I did, it’s sub-optimal. When prompted in the install processtt, select the RAID1 partition you created above. For me this was /dev/sdg, but will likely be different for you. I used LVM with otherwise default partitions. For ease of setup, I suggest selecting “OpenSSH Server” when prompted for “Software select”. This way we won’t have to install and enable it later. If I do indeed have a failure where I’m nervous about either the RAID1 or RIADZ pool, I can always yank a drive from one pool to another. In order to have a log and cache drive (which can be the same physical disk), I’ll split it so 5 drives store data and 1 drive with two partitions store my log and cache. Read up those log and cache links to see how these greatly improve ZFS performance, especially if your data drives are slow and you have a fast cache drive (SSD or better). Ok, so we’ll use sdf1 as log and sdf2 as cache. Now what are they’re corresponding IDs? This will allow the VMs to use br0 to natively bridge up to enp1s0f0 and either get a DHCP IP from that LAN or be assigned a static IP. In order for this change to take effect, reboot the host machine. Jason’s guide suggests running ifdown and ifup, but I found I just lost connectivity and only a reboot would work. When you next login, be sure you use the new, static IP. Success! LXD is all set up now. Let’s prep the host OS for a bunch of open files now. Finally, we want to limit this container to have 4 CPUs, have 4GB of RAM and 20GB of disk. Like before, these commands are not run as root. They are imposed on the container in real time and do not require a restart. Go LXD, go! You’re all done! From here you can trivially create tons more containers. You can let them have an ephemeral IP via DCHP on the bridge or easily set a static IP. If you have a resource intensive need, you don’t set the limits above, the container will have access to the full host resources. That’d be 40 cores, 64GB RAM and 1TB of disk. If you created more VMs with out resource limiting, LXC would do the balancing of resources so that each container gets it’s fair share. There’s a LOT more configuration options available. As well, even the way I declared a static IP can likely be done via dnsmasq, (see this cyberciti.biz article), but I had trouble getting that to work on my setup, hence the raw calls. Now that you you’ve bootstrapped your bare metal, dialed in your storage back end, specifically deployed your LAN, you should be all set, right? Not so fast! To make this more of a production deployment, you really need to know how (and practice!) your backup and restore procedures. This likely will involve the snapshot command (see post 3 of 12) and then backing those snapshots off of the ZFS pool. Speaking of the ZFS pool, our set up as is doesn’t have any alerting if a disk goes bad. There’s many solutions out there for this – I’m looking at this bash/cron combo. Having a more automated system to provision containers integrated with a more DevOps-y set up makes sense here. For me this might mean using Ansible, but for you it might be something else! I’ve heard good things about cloud-init and Juju charms. As well, you’d need a system to monitor and alert on resource consumption. Finally, a complete production deployment would need at least a pair, if not more, of servers so that you can run LXD in a more highly available setup. Given this is my first venture into running LXD, I’d love any feedback from you! Corrections and input are welcome, and praise too of course if I’ve earned it ;) Thanks for reading this far on what may be my longest post ever!